It seems logical that because a patient’s mouth is flexible, a rigid metal-based partial would not be well suited to its form and function. That’s what inspired Valplast to create the flexible RPD. Today dentists are prescribing flexible materials for removable partial dentures (RPDs) because it makes a better, stronger appliance faster. Flexible material reduces chair time, eliminates invasive procedures and the cumbersome materials associated with rigid partials. In short, there is no longer any need for metal. 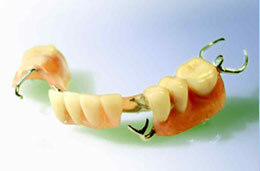 Flexibility removes many of the unwanted aspects of metal partials. There are fewer steps in the treatment process because preparation of natural teeth is unnecessary . Without the metal frame, the fabrication and try-in process have also been simplified. In addition, the choice of a Valplast partial avoids the placement of metal in your patient’s mouth, which allows you to satisfy the patient’s interest in metal-free dentistry. 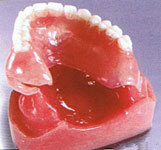 The ideal impression medium for Valplast flexible dentures is alginate, to ensure the correct function of the denture muco-static impressions are essential. A free practice pack is available on request which explains the finer points of fitting and, if necessary, adjusting Valplast partials. Valplast is not an acrylic and requires different techniques for handling, fitting, adjustment and polishing – all this is explained in the Practice Pack. Rigid RPDs are held in place by support and retention devices that leverage tooth surfaces to distribute the masticatory load. 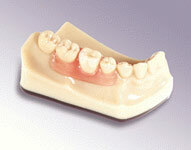 Valplast developed a higher standard of performance by utilising a flexible material to replace the retentive arms and reduce stresses on natural teeth The concept uses the the flexibility of the material to balance the stress load over the entire supporting ridge instead of individual rigid support points. 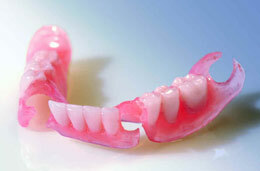 As a result, the patient is more comfortable and has a stronger, better looking and functioning appliance. To hold them in place, traditional rigid partials have noticeable, unattractive metal clasps across the front surface of the natural teeth, which may, over time, cause damage to the tooth surfaces and reduce the stability of the supporting teeth. Valplast’s unique material blends with the natural tissue providing virtually invisible support and a more pleasing smile. Valplast is available in four natural tones – pink, light pink, meharry and light meharry – to match the patient’s colouring. 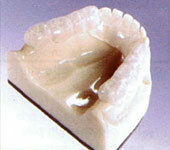 A non-pigmented option is also available for special applications. Gum Veneers; Night Guard; TMJ Splints; Space Maintainer; For replacement of missing teeth in paediatric cases; For patients prone to breaking dentures or in unsafe environments; e.g. policemen and firemen; For periodontally comprised teeth. Valplast Flexible Partials can only be obtained from Valplast Certified Laboratories – Certification is your assurance of quality and technical knowledge from your Valplast Lab. Certification means that the lab has at least one technician who has gone through the Valplast comprehensive, hands-on training and has met the Valplast rigorous professional standards. At Albion Dental Laboratories we are pleased to be a Valplast Certified Laboratory.